Exercising regularly, avoiding smoking and controlling your blood pressure can help you avoid a heart attack. 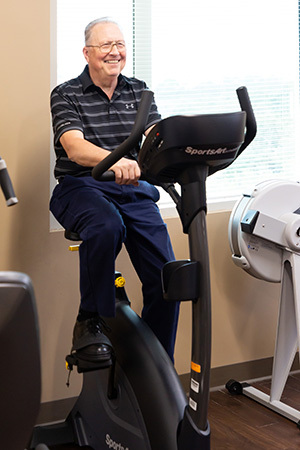 From miles of walking on the golf course to thousands of miles cycling from California to Texas, fitness was a part of John Bush’s everyday life. So when he started to feel tired after everyday activities, he knew something wasn’t right. Bush, a Fernandina resident, scheduled an appointment quickly with his primary care physician. 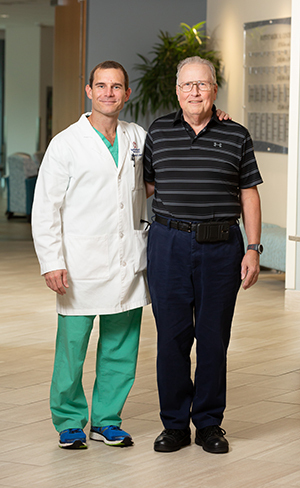 His primary care physician, Britt Taylor, MD, saw him quickly and referred him to Baptist Heart Specialists. Though Bush’s stress tests earlier in the year appeared normal, Dr. Taylor knew Bush’s symptoms warranted a quick referral. George Le-Bert, DO, a cardiologist with Baptist Heart Specialists at Baptist Medical Center Nassau, saw Bush the very next day. Dr. Le-Bert knew that a diagnostic cardiac catheterization was the next step – and fast. The term “widow maker” is commonly used as a nickname for a blockage in this specific artery because it is the largest of the three providing blood to the heart. “A complete blockage in this artery can be fatal,” said Dr. Le-Bert. Bush required one stent to keep the artery open, reducing the chance of a future heart attack. Bush was happy to be back swinging on the golf course and cycling down the back roads in Fernandina Beach after cardiac rehab at Baptist Nassau Cardiac Rehabilitation Center. “I have my youthful energy back,” said Bush. Cardiologists with Baptist Heart Specialists are available at nine convenient locations in Northeast Florida to heal hearts close to home. For more information, visit baptistjax.com/heart.